… i only have great words of appreciation for everyone I ‘ve met. There are many things to say about this trip but one of the most important is the fact that it felt like home. This is totally thanks to Javi and his family, Sandra and her family as well who welcomed me and made me feel as part of them. I really appreciated the family atmosphere which is exactly like my family in Greece. In addition, I need to illustrate the fact that Greeks and Spanish are the same. Exactly the same. Είμαστε ίδιοι, somos iguales. The next best thing is the food!!! 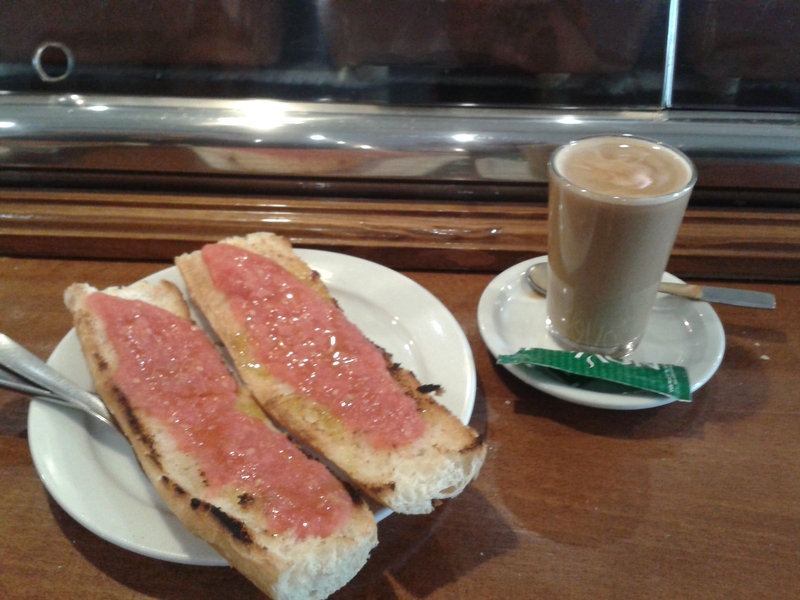 One of the typical spanish breakfasts (other than churros y cafe con leche) you can have this toasted bread with tomato and olive oil (salt is not mandatory). I did appreciate la tortilla de patatas (the spanish omelete) and of course the amazing conchinillo (baby pig). It was a great holiday, great people, great city and it is definately worth the visit. This entry was posted in Interesting and tagged food, Greeks, holiday, Madrid, Spain, Spanish. Bookmark the permalink.